In 2017, the State of California declared its official state dinosaur to be Augustynolophus morrisi Prieto-Márquez et al. (2014), a duck bill of Late Cretaceous age. Duck bills are classified as hadrosaurs. The generic name, Augustynolophus Prieto-Márquez et al., 2014, is a combination of the Augustyn family, who helped support the Los Angeles County Museum of Natural History, and the suffix “lophus,” in reference to its similarity to Saurolophus, another duckbill, 30 to 40 feet in length, bipedal, and with a battery of flat teeth used for chewing coarse vegetation. Augustynolophus, like Saurolophus, has a bony, spikelike crest that projects up and back from the top of the skull. This spike is an extension of the nasal bones. Augustynolophus morrisi is of late Maastrichtian age, about 68 million years old. 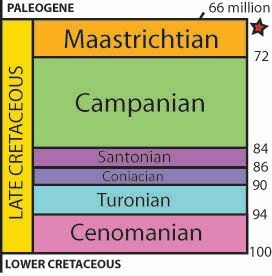 The geologic time diagram below depicts the recognized intervals of time that constitute the Late Cretaceous. The Maastrichtian was the last stage of the Late Cretaceous. 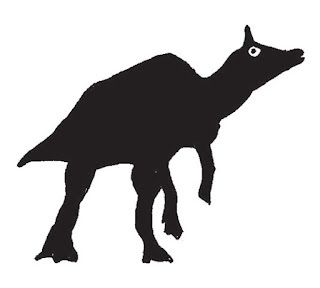 The red star indicates the approximate occurrence of this dinosaur. 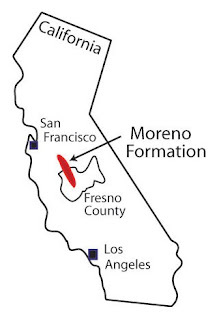 The bones of A. morrisi have been found in the Moreno Formation along the west side of the San Joaquin Valley, Fresno County, central California. In terms of vertebrate (back-boned) fossils, the Moreno Formation is mainly known for its marine-reptiles (plesiosaurs and mosasaurs). It also contains marine-mollusk fossils (oysters, other bivalves, and gastropods). Augustynolophus morrisi lived in a marshy, coastal area. Augustynolophus morrisi is endemic (only found) in California. For excellent copyrighted pictures of this dinosaur, also known as "Auggie," just "Google" its scientific binomial (two-part) name. The species name, morrisi, is in honor of the late William J. Morris (1923-2000), a highly respected vertebrate paleontologist who had many dinosaur and other vertebrate-fossil discoveries on the west coast of North America, especially in Baja California, Mexico. His final teaching position was at Occidental College in the Eagle Rock neighborhood of Los Angeles, California. He was also a Research Associate in Vertebrate Paleontology at the Natural History Museum of Los Angeles County. 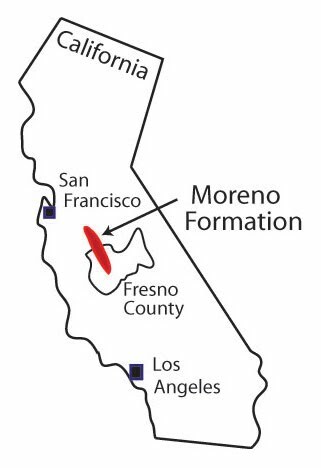 If you want to see the entire list of official California names of other geologic entities, go to <en.wikipedia.org>, and click on the associated thumbnail images in order to see larger images.